Hello friends! 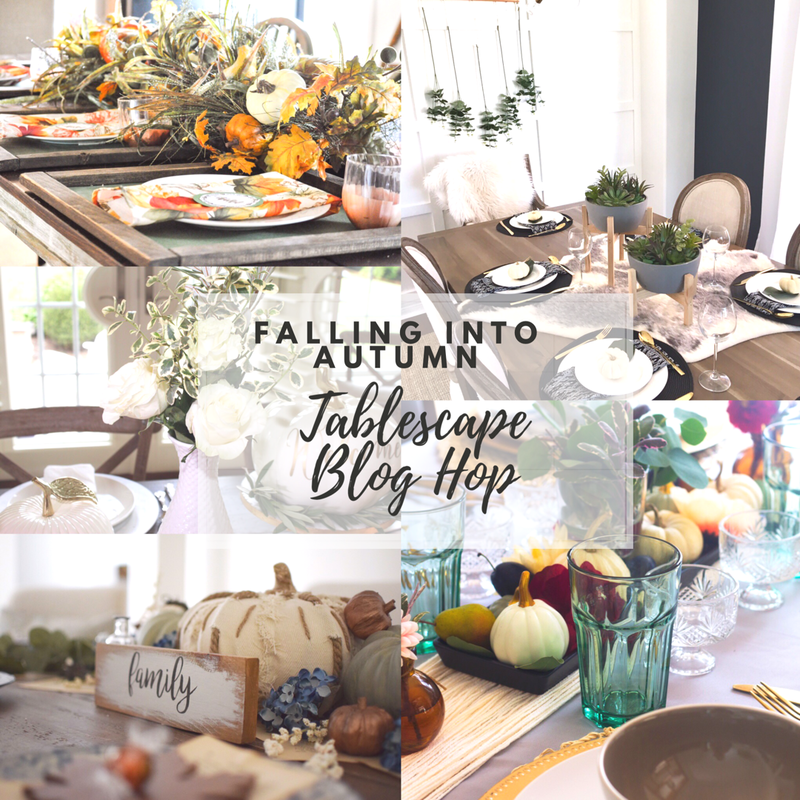 I am so excited to bring you Falling into Autumn, a fall tablescape blog hop, with some incredibly talented bloggers! If you are here from Andrea of Harlow and Thistle , welcome and thanks for stopping by! 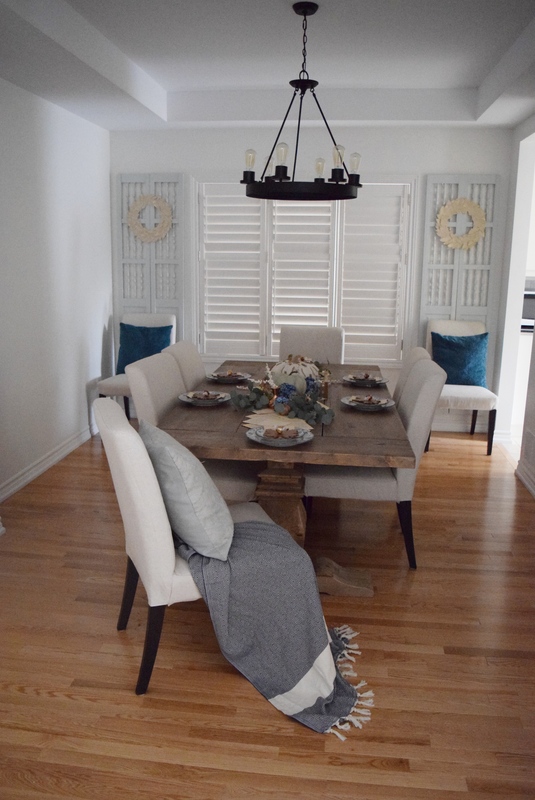 Let me start off by saying that I am not very good at tablescapes of any kind so this was definitely a challenge for me! I knew I wanted to incorporate books in some way, but wasn't sure how! I was flipping through some of my old books that I had recently purchased at Value Village and I thought hmm how about pages as a "runner of sorts" - but I couldn't bring myself to rip a book because I love books and ripping them just seemed.. wrong? If that makes any sense. Anyway, I found a book in my pile that was pretty much falling apart and I could justify teasing it apart hehe. 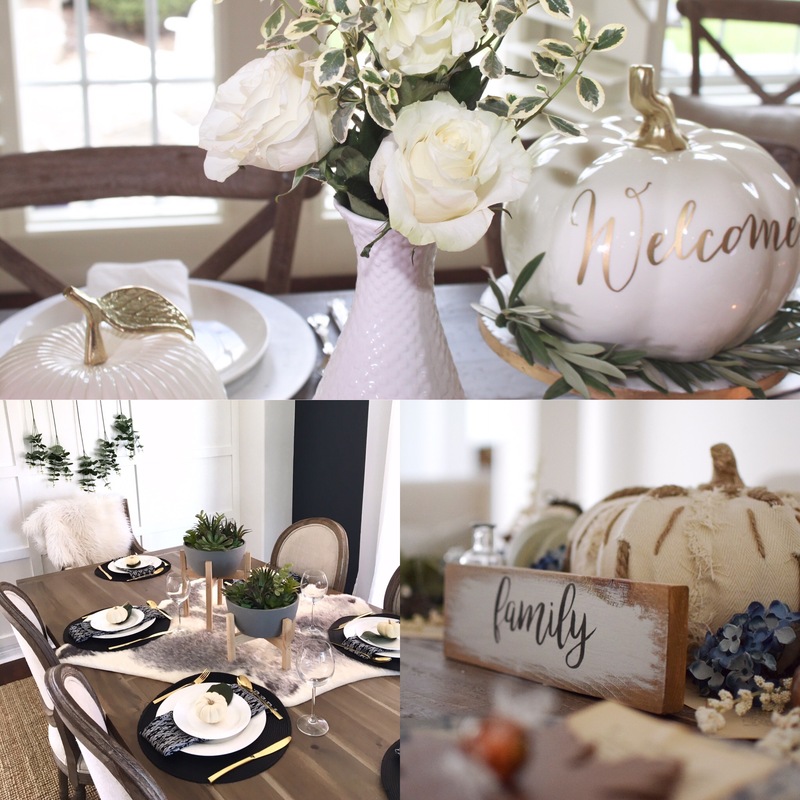 I stayed with the same colours, I had used in our entryway (as seen HERE) - muted mint and white pumpkins, sprigs of greenery to add warmth and added pops of navy and some cute copper knick knacks I also got from a recent trip to the thrift store. 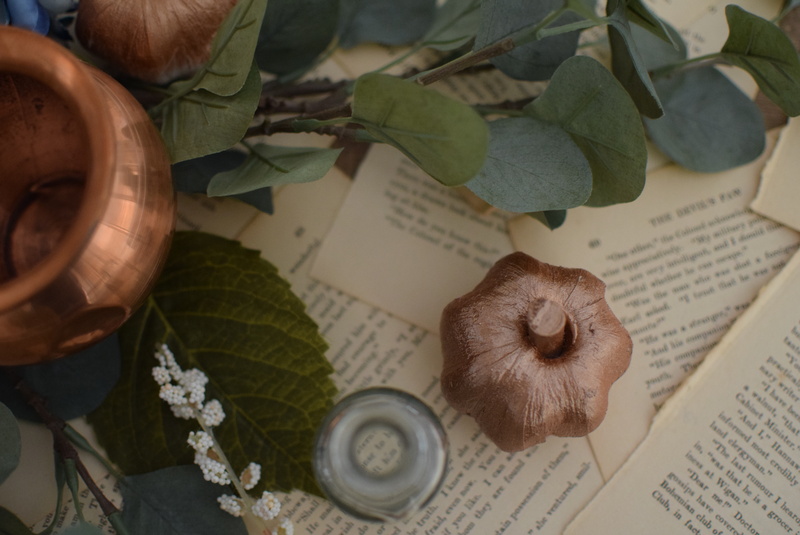 I also added these copper "pumpkins".. 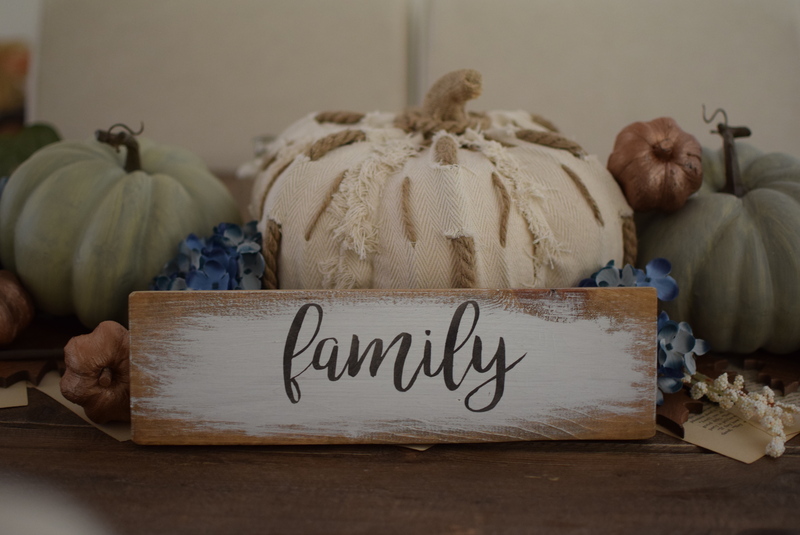 Funny story - I bought these at homesense in a pack last year for like $7 and spray painted them copper this year.. but I think they are actually faux garlic and not pumpkins.. oh well! now they are copper pumpkins right.. lets pretend they are at least. 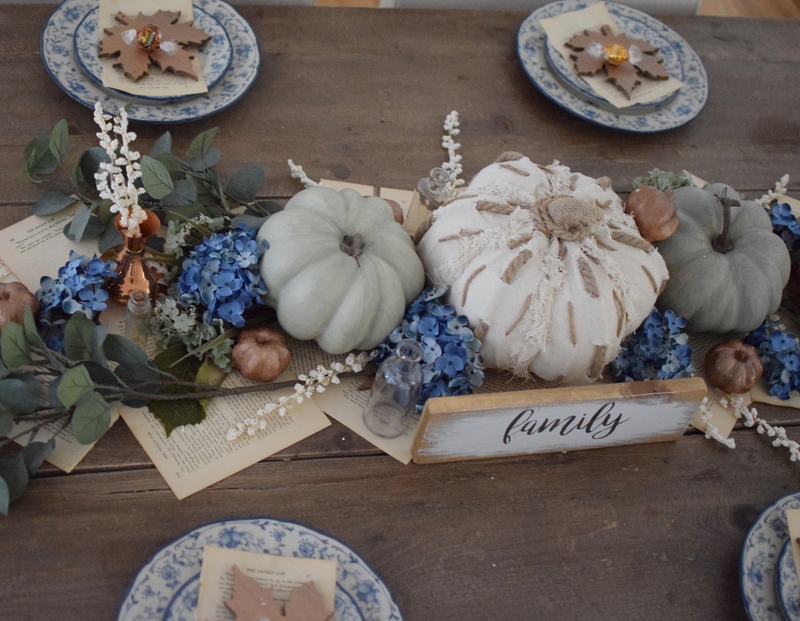 I also added some vintage bottles in for that extra texture and depth to the tablescape. Essentially, the main trick to this tabelscape was layer after layer and playing around until I got to the look I wanted. As the final cherry on the cake, I added this adorable mini sign by the talented Bexley Boys who make the most adorable little signs ever! You must check them out! 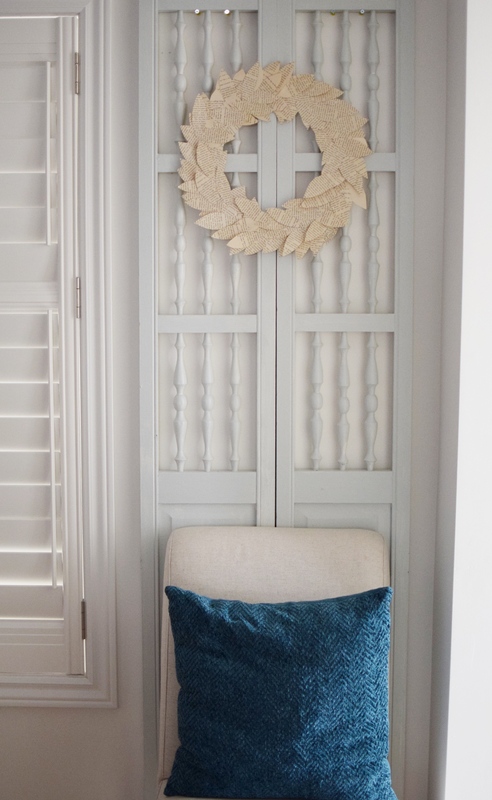 To add to the general decor, I painted these vintage pocket doors (salvaged from a family friend's home renovation a couple of years ago) in Sherwin Williams Sea Salt and put them up to visually extend the windows and add some interest to that back wall. I also made the "magnolia book wreath's" (Tutorial coming soon!) 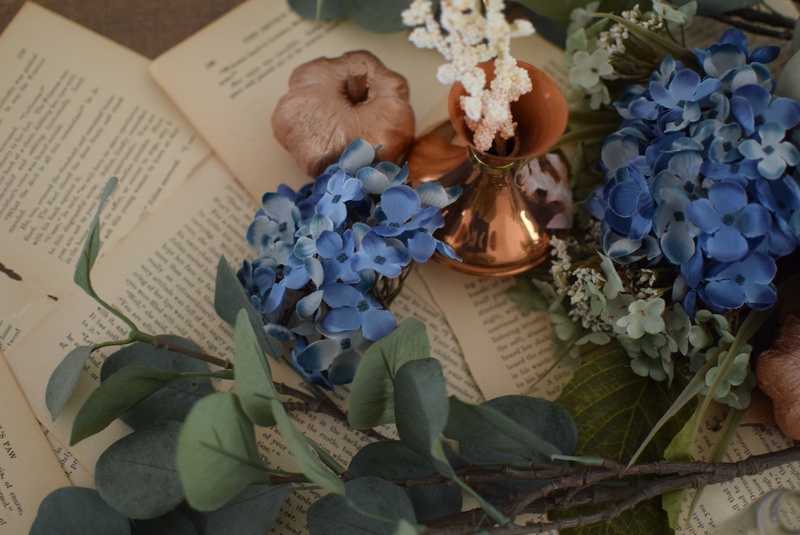 to add a touch of vintage books there too 🙂 I have linked similar book wreath's in the sources below if you want to purchase ready made ones from some talented folks! 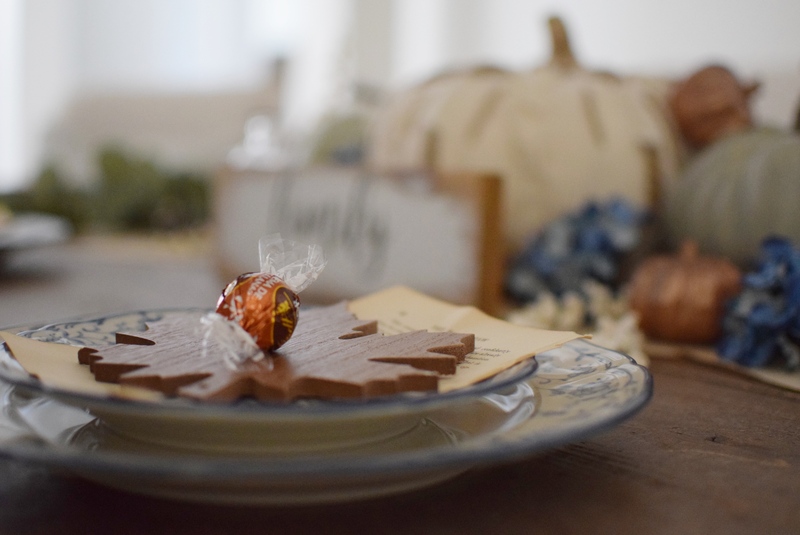 Don't forget to check out the rest of the beautiful tablescapes in the Falling into Autumn Blog Hop linked below! What a clever idea using books! I would never have thought about that, I love it! And the copper and blue is a beautiful combination. 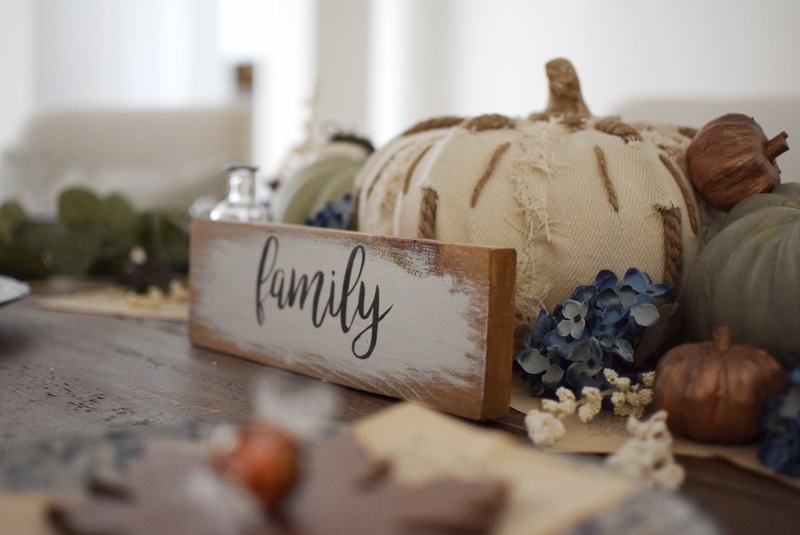 LOVE LOVE the book page table runner!!! It’s all so gorgeous! OMG this looks beautiful. 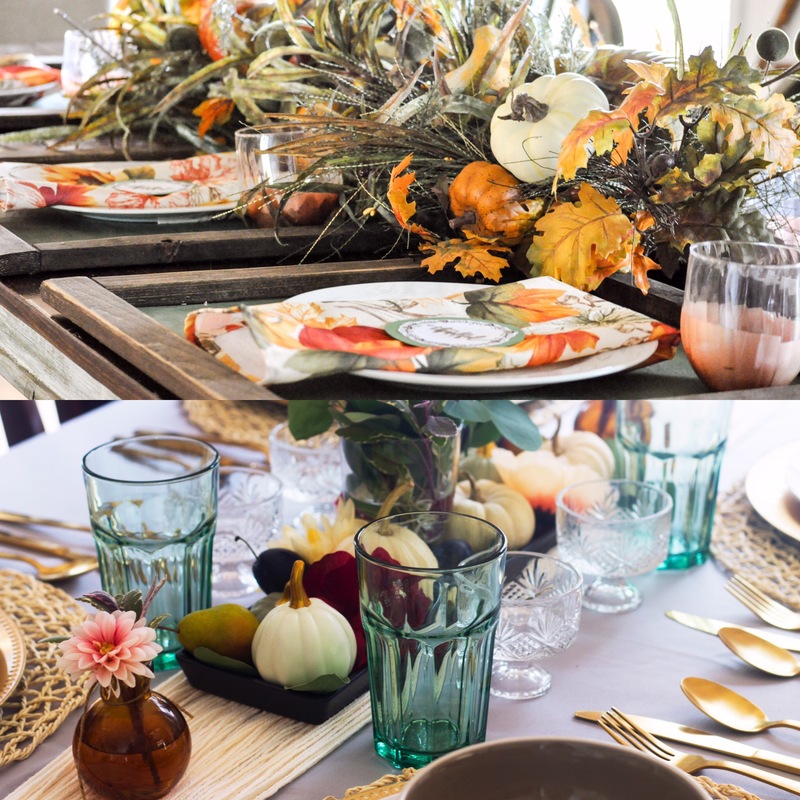 I can’t believe you find tablescapes challenging – you’re so good at them! 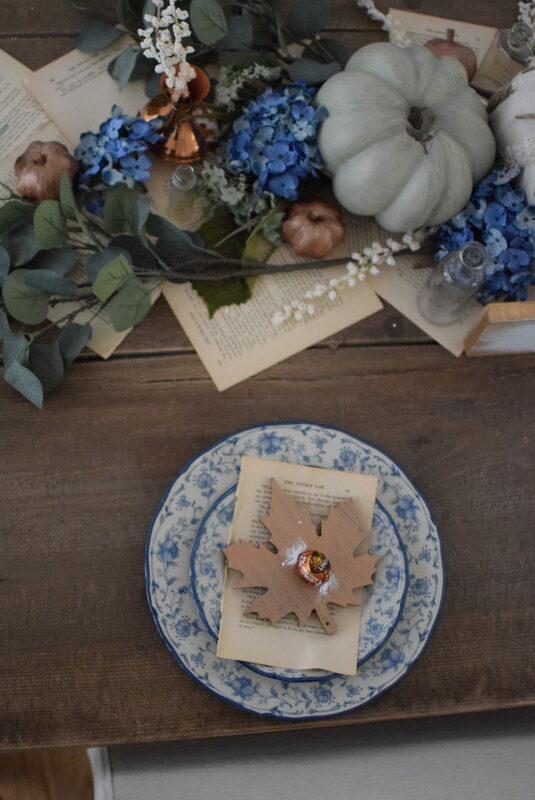 Using book pages as a table runner is genius!